This isn’t the first that that BMW is coming up with a special edition model like BMW M4 GTS 2016. They have been rolling dices prior with their one or the other innovative performance oriented luxurious piece of engineering and design. Keeping the same trend at the tokyo motor show 2015 they shared this impeccable piece. 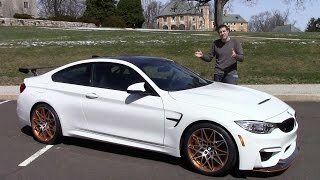 Let us have a look at the review of BMW M4 GTS 2016 to know more about it. The interior of BMW M4 GTS 2016 though is based upon the M4 but has numerous features that one won’t expect in any standard coupe and why not afterall it’s a limited edition model. To provide the boldness and sportive touch almost entire interior gets the essence of either black or dark grey with white contrast stitching on various parts like the Alcantara wrapped three-spoke steering wheel and the GTS lettering on the dashboard. The model is equipped with bucket racing seats with lightweight backrests. 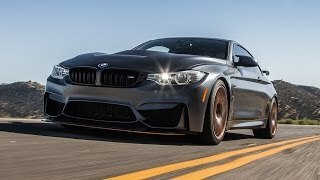 In all the interior details of BMW M4 GTS 2016 are primarily same as base model, the only major difference is the weight-saving and use of stitching and upholstery to make it look unique. The exterior of BMW M4 GTS 2016 is very much similar to the concept that company unveiled in recent past. Starting with the front fascia there is an adjustable carbon-fiber splitter and a broad air intake housed in the middle of that aggressive bumper. The unit has been prepared in a way to deliver optimum airflow inside for a better experience. Moving towards the rear end there is a massive adjustable wing housed over the trunk lid and beneath is a redesigned diffuser. The tail lights come integrated with signals that symbolizes that the model isn’t a regular one. 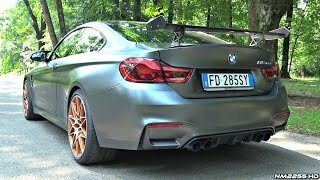 In all rounding up the details of the exterior of BMW M4 GTS 2016 I would say it looks truly amazing rolling over those bulky 19” front and 20” rear wheels. Beneath the hood of BMW M4 GTS 2016 is a 3.0 liter inline four/six cylinder engine generating total output of 493 hp and peak torque of 600nm paired to seven-speed M Double-Clutch transmission with Drivelogic. With this power figures the top speed of BMW M4 GTS 2016 touches the mark of 190 mph while the 0-60 mph sprint can be knocked in just 3.7 seconds. The last minute rear end spoiler add on just looks horrible and improvised, not integral to the good looking Series M4.